March 23 2015, 11:00 AM EST. After allowing a run in the opening frame, Tim Ponto went on to throw six and 1/3 scoreless innings in what was the senior right-hander’s longest start of the season, holding George Washington until an RBI double by junior right-fielder John Brue brought freshman shortstop Matt Maul home from second to tie the game. The Colonials would take back the lead, however, once freshman right-hander Justin Aungst came on in relief in the eighth. With runners on first and second, sophomore right-fielder Andrew Selby singled to left, allowing freshman Robbie Metz to score from second base and put George Washington back up 2-1. Ponto was charged with the run and the eventual loss (1-3), with his final line showing two earned runs off seven hits and a walk, and seven strikeouts in seven and 1/3 innings pitched. Metz, who got the start on the mound for the Colonials, struck out three, walked two and allowed an earned run off six hits in five and 1/3 innings pitched. He remained in the lineup as a designated hitter for the rest of the game. George Washington’s freshman right-hander Brady Renner, senior right-hander Craig LeJuene and sophomore right hander Eddie Muhl combined for three and 2/3 scoreless innings in relieve to close out Sunday’s first half. The Hawks left 13 runners stranded through the first nine. The latter half of the doubleheader saw another St. Joe’s starter have his longest outing of the year, as Pat Vanderslice went on to throw seven shutout innings. The right-handed sophomore, who transferred from Temple after last season, allowed just four hits and two walks, while striking out two. Sophomore right-hander Ryan Kelly and senior right-hander Lansing Veeder finished things up by allowing just one hit in the final two innings. 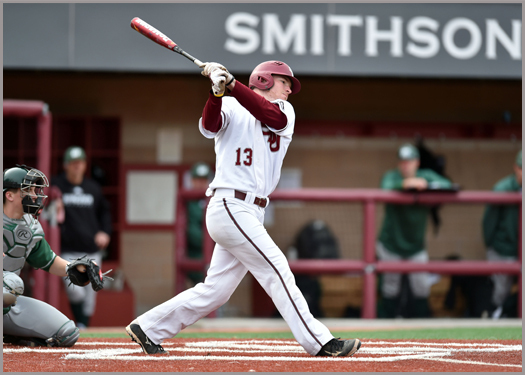 Meanwhile, St. Joe’s bats had no problem putting runs on the board in game two, tallying five earned runs off Colonial’s junior starter Bobby LeWarme, who also gave up seven hits, but struck out seven. Brue drove in the lone run in the first game, then wasted no time in the second. He got a read on LeWarme and launched a two-run bomb to right-center in the first inning. Senior third baseman Stefan Kancylarz followed up in the second with a three home-run to put the Hawks up 5-0. Then freshman first baseman Dominic Cuoci added one more insurance run in the eighth on an RBI double that brought sophomore left-fielder Cal Jadacki, who reached first on a walk, home. The Hawks stand at 7-10 (1-1 A-10) after Sunday, but have won four of their last six, after beginning the season 1-8.